Dental implants have revolutionized the dental world. Before dental implants, great lengths were taken to try and 'save' a tooth because the alternatives were too problematic. A patient could easily find himself going from specialist to specialist for second opinions, spending money over and over again, crowning and recrowning, taking antibiotics, doing root canals and repeat treatments of the failing root canal, and hoping and praying in the name of heroic dentistry – all while in constant pain. Today, although a dentist's main goal is still to preserve the natural dentition, we can also take long-term functionality into consideration. In some cases, better success rates are achieved with dental implants instead of doing multiple procedures on a single tooth that may not be salvageable. Removable partials, dentures, and bridges are not the only way to replace missing teeth anymore. No more having to floss under bridges and taking partial out at night. Implants are permanent, durable, long lasting, and are kept clean like any other tooth in the mouth. 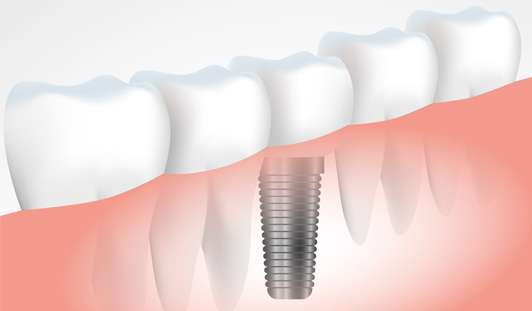 Implant systems are composed of two parts: The implant is a bio-friendly titanium rod that resembles a screw and is surgically placed in the upper or lower jaw. The other part is a crown that sits on the implant above the gums. In other words, the implant replaces the roots of the teeth and is the anchor for a crown that looks and functions like a natural tooth. Dental implants can be used to replace any number of missing teeth, and are versatile enough to be placed in the front or the back of the mouth, and even esthetically in the smile zone. Implants can also connect to dentures for added retention, better speech, and improved ability to eat. As with most facets of general dentistry, only a professional dentist will be able to know for sure if dental implants are right for you. Dr. Zuhaib is one of the top Pakistani dentists who have integrated dental implants into their practices. He is familiar with both the surgical placement and restoration of implants, the various types of implants on the market today, and use of implants in conjunction with full dentures. In general, those with adequate quality and density of bone and good oral hygiene are good candidates for implants. Smokers, patients on certain medications like Fosamax and other bisphosphonates, or patients who are medically compromised may need to take additional precautions. There are three stages to the dental implant process: diagnosis, placement, and restoration. The treatment takes several months from start to finish. The diagnosis involves all the necessary X-rays, any additional 3-D CT scans, the creation of models of the upper and lower jaws, and photos. Placement of the implant can occur immediately after a tooth is pulled, or delayed until the extraction site has healed. Once the dental implant is surgically placed, bone will begin to form around it.Some times due to patient factors IMPLANTS MAY FAIL (Come out ) due to non healing or non adhernce of patient to the instructions given. Complete bone formation surrounding the implant usually takes 3-4 months. Once the bone has formed completely, the crown is made to fit the implant in the correct size, shape and color. If I have a little time and cant wait 3-4months?? Most patients experience mild discomfort after the placement of the implant that is usually well controlled with over-the-counter pain medication. Discomfort during the procedure can be avoided by simply numbing the area where the implant is to be surgically placed, but for those who are more anxious, Surgi-Dent offers intravenous sedation - you can wake up at the end of the procedure without having felt any discomfort at all. I have a few missing teeth, but I am still able to eat well. Do I still need an implant? The jaw supports your teeth, and once you lose a tooth, the bone begins to shrink in all dimensions. In other words, it starts to recede. The longer you wait to replace a tooth, the more bone is lost. And without a good foundation, future implant placement becomes more complicated and less predictable. Also, each tooth in our mouths is a placeholder and has a specific job in the mouth. When you remove a tooth with an extraction, you lose this placeholder, and the other teeth have to compensate and get overworked. In addition, the surrounding teeth will begin to shift, resulting in a change in your bite. This not only impacts your teeth, but also adds extra pressure on your jaw joint. I have no teeth and wear upper and lower dentures. Going out to restaurants or talking with other people is very hard. Can implants help? Millions of edentulous people have regained their confidence with the use of dental implants in combination with their dentures. Eating is improved, speech is clearer, and facial features are restored because when dentures are supported on implants, retention is optimum. The dentures do not move around or tip during speaking and eating. There is even an option of never having to remove your dentures at night. Permanent fixed dentures are the closest things to your previous dentition. Dr. Zuhaib will be able to come up with the right treatment that is both affordable and suitable to your lifestyle. At Surgi-Dent we aim to provide best dental care in Lahore. We believe in innovation and adoption of latest dental technology and dental equipment that ensure proper and effective dental care. Surgi-Dent has a team of efficient dental surgeons which are admired and recognized by people of Lahore. Shop No. 1, Main Road Samanabad Near 1st Round About, Adjacent Shezan Bakery & Kims Dera, Lahore. 7-F Main Boulevard PIA Society Near Wapda Town Round About Basment Punjab Medical Store, Lahore.